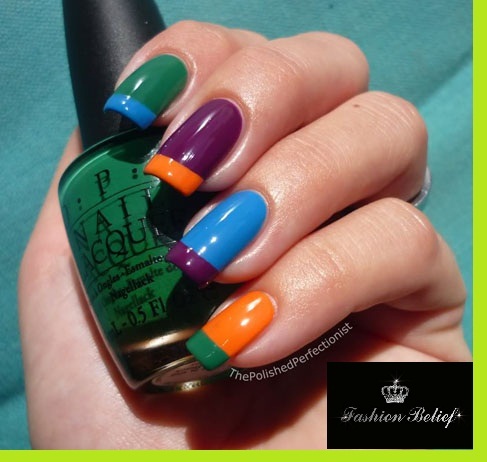 The post below is aimed to reveal the basic steps towards a multi-color nail polish, which produces incredible visual effects. In order to illustrate the technique best, we shall stick to the blue nuances (please note that you can choose any color that you like). So, what we need to get started would be 4 kinds of blue nail polish of different shades, a polish containing shiny particles, a top nail polish and a cosmetic sponge (the type used to apply foundation when you prepare your face for the makeup). The first step is to apply the lightest nuance of the nail polish all over the nail. Make sure you leave no spot unpolished. Let it dry thoroughly, after which use the cosmetic sponge. Apply gently the next darker shade of the nail polish and tap the sponge carefully on the nail plate edges. The harder you press, the darker your nails will look, so make sure you do not cover entirely the base color that we first applied. Continue in similar fashion with the rest of the darker shades. Once done, it is time to use the polish with the shiny particles. The key here would be to use another sponge, which will soak the most of the polish, so that you can make the best of the shiny bits. The end of the whole beauty procedure would be to apply the top polish, which will help preserve your nail for a longer period of time!